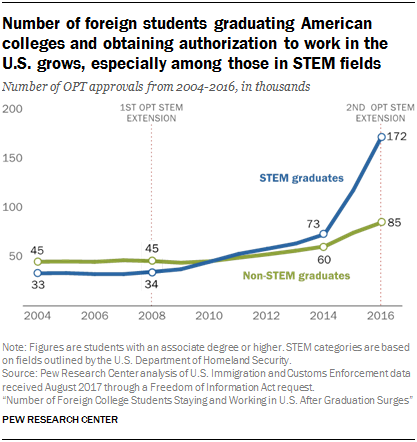 Many foreign STEM graduates enrolled with OPT after executive actions in 2008 and 2016 initially doubled (29 months), then later tripled (36 months), the maximum length of employment for foreign students with STEM degrees. The number of foreign STEM graduates participating in OPT grew by 400% since the first employment extension was introduced in 2008. OPT is one mechanism by which the U.S. can compete with other countries for top talent. 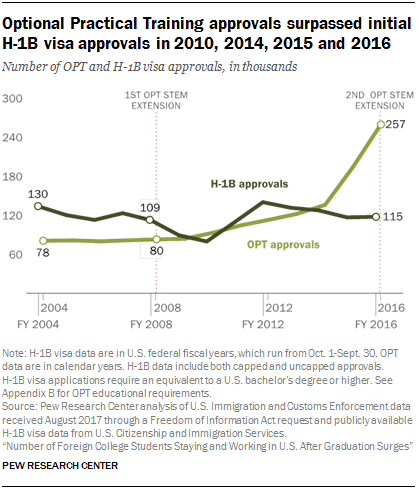 It is less well-known than the H-1B visa program – which enables U.S. companies to hire highly skilled foreign workers and is the nation’s largest temporary employment visa program – yet OPT approvals actually outnumbered initial H-1B visa approvals in recent years.2 In addition, OPT’s eligible population has been on the rise: Between 2008 and 2016, new college enrollments among foreign students on F-1 visas grew 104%. Although the data referenced in this report cover F-1 visa holders approved for OPT participation between 2004 and 2016, only those who pursued degrees in higher education (associate, bachelor’s, master’s or doctorate) are included in the analysis. This data made it possible to map where foreign college graduates came from and where they were going – both for their education and their OPT employment. Major metro areas in the U.S. tend to attract large numbers of foreign students and also keep a significant share as OPT enrollees. By contrast, smaller-sized metro areas often see local foreign graduates relocate elsewhere as part of OPT employment. View our interactive to see where foreign student graduates under OPT worked in the United States, by the top 61 metro areas with the largest number of graduates approved for OPT between 2004 and 2016. Only foreign students enrolled full-time at U.S. colleges and universities are eligible for OPT. The most common type of visa for foreign students is the F-1 academic student visa, which is typically given to those pursuing degrees in higher education. The number of newly enrolled foreign students with F-1 visas at U.S. colleges and universities has grown dramatically in recent years, increasing from 138,500 in 2004 to 364,000 in 2016. Much of this growth happened after the start of the Great Recession at the end of 2007. Between 2008 and 2016, new foreign student enrollment has increased by 104%, far outpacing overall college enrollment growth, which was 3.4% during the same period, according to U.S. Census Bureau data. This increase was greatest in public colleges and universities, which faced budget cuts during the recession and began to rely more heavily on tuition from foreign students. For more in-depth analysis, see this Pew Research Center study on foreign students in the U.S. and its related fact sheet. More than half (53%) of students authorized to work under OPT during the 2004-2016 period graduated with a STEM degree from a U.S. college or university, according to the Center’s analysis of ICE data.3 STEM graduates with master’s degrees made up roughly a third (34%) of all authorized OPT enrollees. The overall surge in the number of foreign college graduates participating in OPT is largely attributable to a 400% increase in STEM graduates approved to temporarily work in the U.S. since 2008. Among OPT participants with doctoral degrees, 78% studied in a STEM field, while among those with master’s degrees the share was 60%. STEM graduates made up smaller shares of OPT participants with bachelor’s (33%) and associate degrees (12%). The top fields of study among OPT participants with doctorates were engineering (34%), physical sciences (16%) and biological and biomedical sciences (13%).4 Foreign graduates with master’s degrees concentrated in the areas of engineering (27%), computer and information sciences and support services (22%), and business, management, marketing, and support services (22%). OPT enrollees with bachelor’s degrees most often completed majors in business, management, marketing, and support services (32%), engineering (12%), and the social sciences (9%). Transitioning to the H-1B visa is one of the pathways that foreign graduates can pursue to stay in the U.S. once their OPT period expires.12 However, there is no guarantee that H-1B visas will be available for employers who want to sponsor foreign graduates working under OPT. In recent years, the number of applications for this visa program has exceeded its annual cap, and a lottery system was put in place to award the visas. The Optional Practical Training program (OPT) was developed to allow F-1 visa holders to gain practical work experience after graduating from a U.S. college or university. In 2007 and 2013, Congress did not pass expansive reforms to the H-1B visa program as part of comprehensive immigration reform bills. At the time, there were proposals to increase the number of H-1B visas as well as legislation to add 55,000 green cards exclusively for foreign student graduates with a STEM degree. With no legislation passed on the H-1B visa program, the residency limit for OPT was extended an additional 24 months for those with a STEM degree. In light of economic concerns and pressure raised by high-tech professionals, members of Congress and U.S. educational institutions, the George W. Bush and Obama administrations expanded the OPT program for those with STEM degrees in 2008 and 2016, respectively. This expansion was intended to prevent a “brain drain,” addressing U.S. concerns of losing students unable to obtain an H-1B visa. The federal government also established the “cap-gap extension,” which extends the OPT period authorization for U.S. foreign student graduates whose work authorization has expired. This extension allows foreign graduates to continue residing in the U.S. if they are attempting to change status to an H-1B visa. Only those with pending or approved H-1B visa petitions are granted cap-gap extension, valid until the beginning of the government’s fiscal year (Oct. 1). With these policy developments, the OPT program has become a more popular pathway that foreign students on F-1 visas are taking to remain in the U.S. after graduation. Foreign students are now given multiple chances to adjust status to the H-1B visa program, which they can then use to potentially obtain a green card. H-1B visas for private companies are awarded to employers on a first-come, first-served basis, with applications accepted each year beginning in April. Employers that are institutions of higher education, nonprofits or government research institutions are exempted from the cap through the American Competitiveness in the 21st Century Act of 2000. Those OPT participants without STEM degrees have two opportunities to find employers to sponsor them under the H-1B visa program (one during the year of graduation and the other during their 12 month OPT period). OPT participants with STEM degrees could have four chances to get sponsored for an H-1B visa because of the additional 24 months that they receive. More recently, a lawsuit filed against the Department of Homeland Security by the Washington Alliance of Technology Workers (WashTech) contested the validity of the STEM OPT extension program that started in 2008. It was dismissed after a new rule by the Obama administration was issued on May 10, 2016. With regard to region of origin, the largest group of foreign students who studied in the U.S. and utilized the OPT program between 2004 and 2016 held citizenship in Asia. Asian foreign student graduates accounted for 74% of all OPT approvals during this period. Graduates of European citizenship were the second-largest group (8%) along with students from Latin America and the Caribbean (8%), followed by African students (5%). In terms of country of citizenship, graduates from India made up the largest share of those authorized to work under the OPT program during this period, with 441,400 (30% of the total). Students from China came second at 313,500 (21%), followed by South Koreans at 90,800 (6%). Among citizens of India, STEM graduates made up the majority of OPT participants. Between 2004 and 2016, the number of students from India graduating with STEM degrees increased 658%, compared with a 93% increase for Indian students with non-STEM degrees. Between 2004 and 2016, foreign graduates with master’s degrees far outnumbered all other degree holders under OPT, making up 57% (840,800) of all graduates in the program. The number of master’s degree holders also grew the most by far during the same time period, rising from 39,500 in 2004 to 172,900 in 2016 – a 337% increase. By comparison, the number of OPT approvals for doctorate degree holders grew by 187%, bachelor’s by 115% and associate degree holders by just 21%. This rapid increase in master’s degree holders took place almost exclusively in the wake of a 2008 revision to OPT that enabled STEM graduates work an additional 17 months in the U.S. The contrast before and after the Bush-era revision is stark: Between 2004 and 2007, the number of master’s degree OPT enrollees decreased by 7%, whereas between 2008 and 2016 it increased by 322%. More than half (56%) of foreign graduates who participated in OPT between 2004 and 2016 obtained their degree from a public college or university. Four-in-ten (41%) came from private universities and colleges, of which 38% were not-for-profit schools and 3% were for-profit institutions. Fewer than 3% of OPT enrollees graduated from schools not classified under the Carnegie Classification of Institutions of Higher Education (CCIHE). Despite these overall percentages, the three top sources of OPT enrollees between 2004 and 2016 are all private, nonprofit colleges: the University of Southern California (27,100), New York University (26,800) and Columbia University (22,600). The top public college for OPT participants is City University of New York’s Bernard M. Baruch College (18,500). Other public schools that graduated significant numbers of OPT enrollees include University of Michigan at Ann Arbor (13,700), University of California, Los Angeles (13,600), and University of Illinois at Urbana Champaign (13,600). 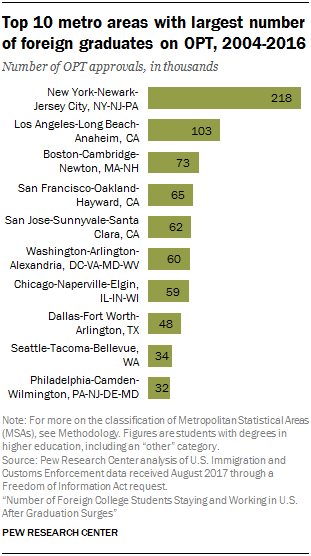 The New York-Newark-Jersey City metro area had the largest cumulative population of OPT participants (218,400).16 That was followed by the Los Angeles-Long Beach-Anaheim (103,600) and Boston-Cambridge-Newton metro areas (73,000). New York’s dominance can be explained in part by its ability to retain foreign students graduating from local colleges: 85% of foreign students graduating from New York-area schools stayed in the metro region to work under OPT between 2004 and 2016. In the Los Angeles and Boston areas, the shares were 78% and 72%, respectively. The Seattle (84%) and Honolulu areas (83%) actually outperformed Los Angeles and Boston in terms of the share of local foreign students retained through OPT. On the opposite end of the spectrum, the Springfield, Illinois, metro area retained the lowest share (7%) of foreign graduates who attended schools in its area. The Carbondale-Marion, Illinois, and Beaumont-Port Arthur, Texas, areas were next above it at 20% and 23%, respectively. Across U.S. metro areas, OPT has resulted in both net “importers” and net “exporters” of foreign college graduates. 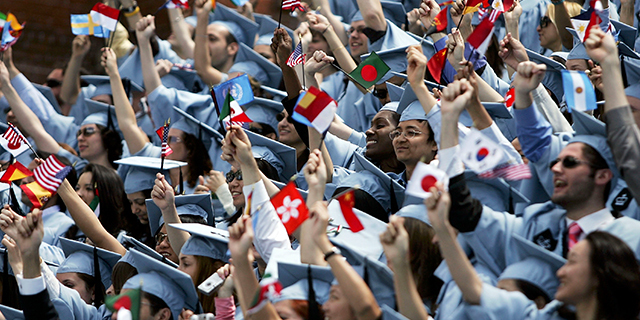 New York topped the list for attracting the most foreign students who graduated from schools outside its metro area, with 74,000 students coming into the area for work between 2004 and 2016. Three California metro areas followed: San Jose (44,500), San Francisco (33,700) and Los Angeles (27,800). The San Jose metro, however, had the largest share (71%) of foreign graduates working in the area on OPT who graduated from other metros. This was followed by the Kansas City, Missouri (69%), and Peoria, Illinois (66%), areas. Even though the New York metro area both attracted and retained the largest numbers of foreign students on OPT, the Seattle area retained and attracted the highest shares of graduates proportionate to its foreign graduate population. This is because the number of students who relocated to the Seattle area (20,500) is larger than the graduates who left (2,700). Overall, the net change in the Seattle metro’s foreign graduate population was 52%, compared with 22% in the New York metro area. To see a sortable table detailing the movement of foreign graduates on OPT by the top metro areas where they attended school, see Appendix D.
See Methodology for details on this section’s calculations. The term OPT is used in this report as a shorthand for Optional Practical Training, a type of work authorization provided by the U.S. government under the F-1 visa program that allows foreign students to be temporarily employed for up to 12 or 36 months in a field that is directly related to their area of study. The term “foreign student graduates” is used interchangeably throughout the report to refer to those who are authorized to work under the optional practical training program. The F-1 visa, or the academic student visa, is a type of non-immigrant visa for foreign individuals who intend to study full-time in accredited academic institutions the United States, which includes colleges and universities, K-12 schools and language training programs. Foreign students refer to individuals who were approved to study in the United States under the F-1 visa program by the U.S. government. The terms foreign students and F-1 visa holders are used interchangeably throughout this report. Students from outside the U.S (not including U.S. territories) wishing to study in the U.S. must go through a process to receive approval for their visas, which includes interviews with U.S. consulates or embassies in their home countries operated by the U.S. Department of State. H-1B visa is the United States’ largest temporary employment-based visa program. It allows U.S. employers to hire foreigners to work for up to six years in jobs that require highly specialized knowledge, and workers’ employment may be extended if they have green card applications pending. For more details on the H-1B visa process, see our previous analysis. Metro areas in this report refer to metropolitan statistical areas (MSAs) that are classified by the U.S. Office of Management and Budget. They consist of at least one large urban core with 50,000 people or more, as well as neighboring areas that are socially and economically linked to the core area. The terms metro areas and cities are used interchangeably throughout this report. STEM extension refers to foreign students on F-1 visas working under OPT who qualify for an additional 24 months of OPT. To qualify, the foreign student must have received a bachelor’s, master’s or doctorate degree in science, technology, engineering or mathematics (STEM) degree in a field on the STEM designated degree program list from an accredited school that is certified by the Student and Exchange Visitor Program.